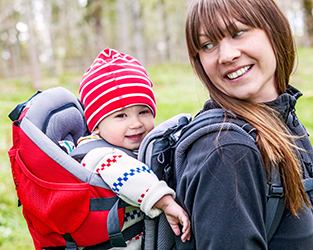 Northpop is a research study in Västerbotten whose goal is that children are to be healthy and to thrive. In recent decades, asthma, allergies, excess weight and behavioural problems have increased among children and youth. We know that the foundation for one’s future health is laid early on in life and we are still lacking important pieces of the jigsaw puzzle of knowledge about how heredity and environment interact during pregnancy and childhood. The aim of the Northpop study is to identify factors for children’s health that can be influenced. The focus of the Northpop study is to identify risk and health factors for common children’s diseases. All parents-to-be in Västerbotten are invited to participate. Each family’s contribution is valuable. The project is being implemented by researchers at Umeå University and staff at Västerbotten County Council. All future parents in Västerbotten are welcome to participate. Every familys contribution is valuable! Det ska bli mycket intressant att se hur stort deltagande det blir i studien. Vi hoppas på att många vill delta och bidra till forskningen om vad som formar oss i början av våra liv. Northpop har förberetts under en lång tid och snart går äntligen startskottet på riktigt! Northpop handlar om medmänsklig forskning, det tycker jag är fint.